My cycling journey began shortly after falling in love with a cyclist. In 2014 he fixed me up an old mountain bike and we hit up the cycle path fairly regularly throughout the summer with short and easy rides. Sensing I had the bug, he then surprised me with a second-hand road bike in March of this year. And how thankful I am! Not having owned a bike since I was a child, I now had a mountain bike AND a super swanky Specialized road bike! 8 months on and I absolutely love my bikes and getting out on them, but . . . I still have much to learn. I can ride a bike – this much is true, however, I’m still that stereotypical girly girl when it comes to actually knowing anything technical about a bike! Really we should blame my partner, and here’s why; with him being a cyclist I have had an easy pass into the cycling world. My bike has been kitted out with the best wheels, gears, handle bars, pedals and so on. But the only thing that I personally requested was fresh, new, pink handlebar tape! If my tyres needed pumping; he did it, if my gears or brakes needed adjusting in any way; he did it. In fact, changes were probably made to my bike weekly at the beginning; improvements were made to make it easier to ride, lighter & more comfortable, but I wasn’t really aware of any of them. I’d hop on when the time came and pedal away to my heart’s content, not knowing the work that had gone in. This was all well and good, until an afternoon ride earlier this summer . . . when I went out on my own. My first solo ride was a big feat for me. I felt nervous and so took a considerable amount of time to carefully map out my route; writing myself clear directions and noting landmarks to look out for to ensure I didn’t get lost (I mean, I really wasn’t going far!) I got everything ready (‘everything’ on this day being my water bottle) and off I went. 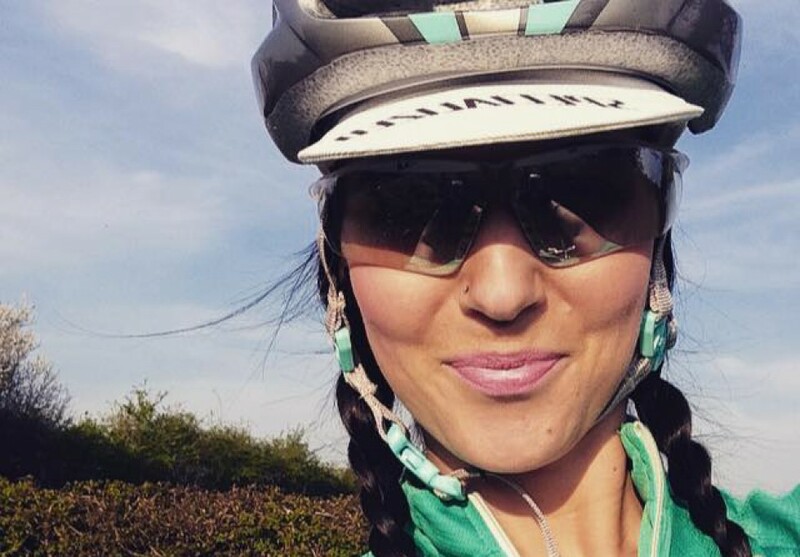 It felt liberating to be out on my own, like this was it – I was now a fully fledged ‘female cyclist’. Go me and all that! I made it approximately 8 miles. Good times. Mid up-hill struggle, out in the glorious countryside, I realised I had a puncture, and was I prepared? – not in the slightest. I had never dealt with a puncture before, and even if I had, I didn’t have any repair tools on me – nothing. Facing a long walk back home I accepted my fate and begun guiding my bike down the hill that only minutes ago I had wobbled up with my puncture. I felt like I should have been carrying an “all the gear, no idea” placard above my head. Very luckily, on what is usually a quiet country road, another cyclist came along and kindly asked if everything was ok. I stated I had a puncture and followed this by embarrassingly admitting I didn’t have any repair stuff on me. Again – luckily – he was able to help. He found what was the most teeny tiny hole, put a patch over it (I wish it was as simple as it sounds) and sent me on my way. I cycled home feeling foolish and very much “a girl”. Lesson learned! I have since made sure that I always ride with a repair kit and spare inner tube. I am still not 100% sure of the ‘puncture repair’ process – these things take practice, but at the very least I now have the tools on me to either attempt to fix it myself, or . . . just hope I run into another kind cyclist who can help me! Throwback! Starting out… Brilliantly improvised eye and footwear here, don’t you think?! Oh & a short denim short – yes, perfect for cycling!!!! Saddle pack / Inner tube / Patches / Tyre leavers / Hand Pump / C02 Inflator Cartridge / C02 Inflator Head / Multi tool – All items can be purchased at any good bike shop! Next Post The Pain & Enjoyment of Winter Workouts!